The Republican Senator and 2016 presidential candidate Rand Paul has announced a crusade against the Patriot Act, promising he will delay Sunday’s debate and force the expiration of controversial provisions that allow bulk spying on US citizens. Earlier this month, the House passed the bipartisan USA Freedom Act which would provide new limits on the NSA data collection. It would do away with Patriot Act’s controversial Section 215, but give phone companies the responsibility of maintaining phone records that the government could search. “Last week, seeing proponents of this illegal spying rushing toward a deadline to wholesale renew this unconstitutional power, I filibustered the bill. I spoke for over 10 hours to call attention to the vast expansion of the spy state and the corresponding erosion of our liberties,” Paul said in a statement on Sunday. “Then, last week, I further blocked the extension of these powers and the Senate adjourned for recess rather than stay and debate them,” he added. The Senate is being called back on Sunday just hours before the midnight deadline. 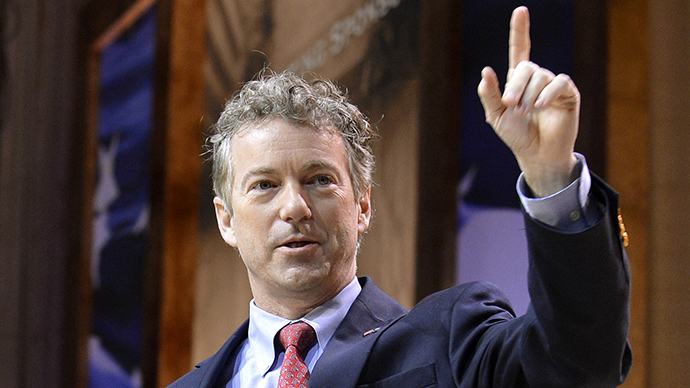 “Tomorrow, I will force the expiration of the NSA illegal spy program,” Paul vowed. There has to be another way. We must find it together. So tomorrow, I will force the expiration of the NSA illegal spy program. Paul who is looking to run for the presidency, also issued a series of short statements on his Twitter page and website. "There has to be another way. We will find it together,'' Paul tweeted. "I do not do this to obstruct. I do it to build something better, more effective, more lasting and more cognizant of who we are." And on his website, Paul said that he has objected to "the illegal spying of the NSA on ordinary Americans'' for several years.